I had the pleasure of popping Jon Jones cherry so to speak at BCX 4, which was only his second MMA fight ever. Yes, I have a knack for picking up on talent! 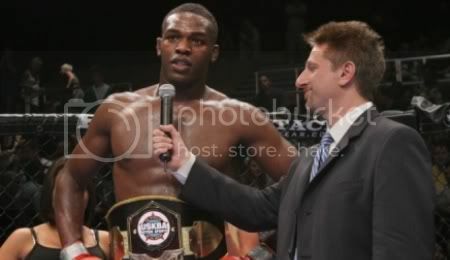 Jones had just won the fight by KO and in the interview he talks about wanting to win "lots of belts" in his MMA career. He's already earned the most prestigious belt of all, the UFC LHW championship belt, but there always HW to move up to, if he decides that one division is just not enough. And a bit of trivia, not seen but heard in the video is AMA Fight Club owner and trainer to the Miller brothers and other UFC stars, Mike Constantino. Also Mrs. TheGARV is the camera person and you can glimpse her in the mirror. But stay focused on the interview, you pervs! Enjoy the vid.